The Israel Antiquities Authority has announced that archaeologists have discovered the remains of massive walls that date back to the late eighth century and early seventh century BCE. The remains of the wall were found at Giv’at Yonah, “The Hill of Jonah,” a place associated with the burial place of the prophet Jonah. According to Dmitri Egorov, an archaeologist with the Israel Antiquities Authority, the wall constituted the base of a large building from the First Temple period. If the date of the wall is correct, then the wall dates to a period when Jonah, a prophet who prophesied in the Northern Kingdom, lived and ministered to king Jeroboam II. In a trial archaeological excavation the Israel Antiquities Authority carried out on Giv’at Yonah in Ashdod . . . remains of massive walls more than 1 m wide were found that are dated to the late 8th century and early 7th century BCE. The discovery of this fortress joins other finds from an excavation that took place very close to this site in the 1960s. 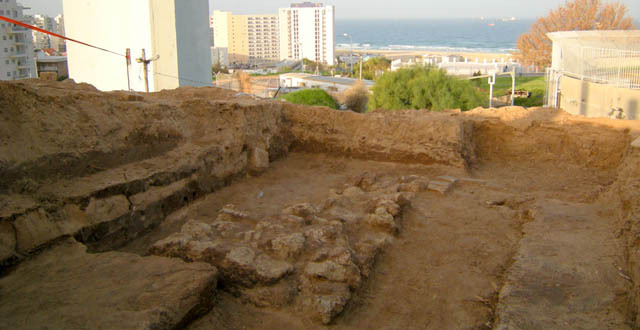 In an excavation directed by Magen Broshi of the Department of Antiquities, which was carried out before the construction of the Ashdod lighthouse, similar wall remains were found that date to the First Temple period and Persian period. In addition, an Aramaic ostracon was discovered on which is written ????? ???? ???? (a contemporary translation:Ba’altzad/Ba’altzar – a first name, Taklan – shekels, and Dashna – a present) – apparently meaning that an individual named Ba’altzad contributed a sum of money that was given as a present for a holy place. Based on the finds the remains are probably an extensive foundation of a structure that was used as a stronghold or fortress that dates to the time of the First Temple. “There are two possibilities regarding who inhabited the fortress at that time: one possibility is that it was controlled by the Assyrians who were the regional rulers in the Iron Age. Another possibility is that Josiah, king of Judah, occupied the fort at the time, who we know conquered territory from the Assyrians and controlled Ashdod-Yam in the seventh century BCE,” he concluded. I think this is another great discovery that helps illustrate the history of ancient Israel. Let us hope that further excavations will reveal additional information that could shed light on the cultural life of the people who lived in the northern part of ancient Israel in the eighth century BCE. This entry was posted in Archaeology and tagged Archaeology, Dmitri Egorov, Giv’at Yonah, Jonah, The Hill of Jonah. Bookmark the permalink.